I photographed this locomotive when I was in Prague at the main train station. 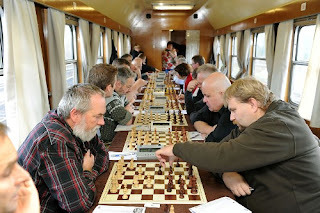 The paint scheme intrigued me - why were there chess pieces on the locomotive? A little research was in order. 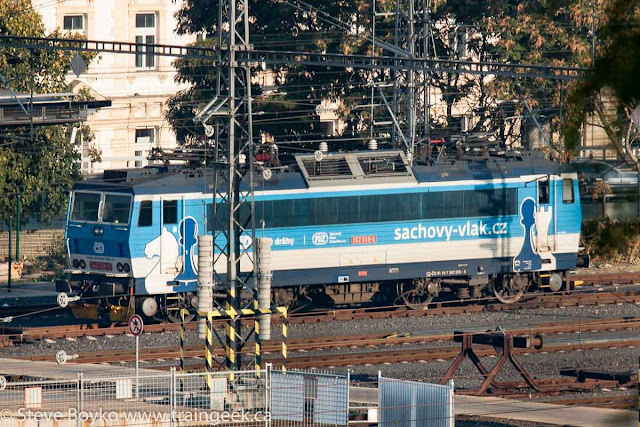 Šachový Vlak means Chess Train. 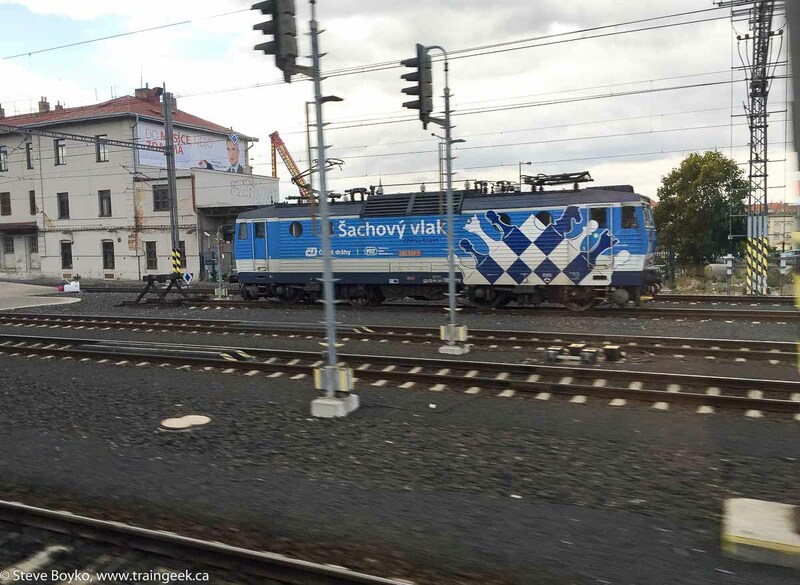 This locomotive was part of the annual Chess Train that hosts an on board chess tournament as it travels from Prague to Vienna and back. The train left Prague on October 9th, a week after my wife and I went home. The train has been running annually since 2011. 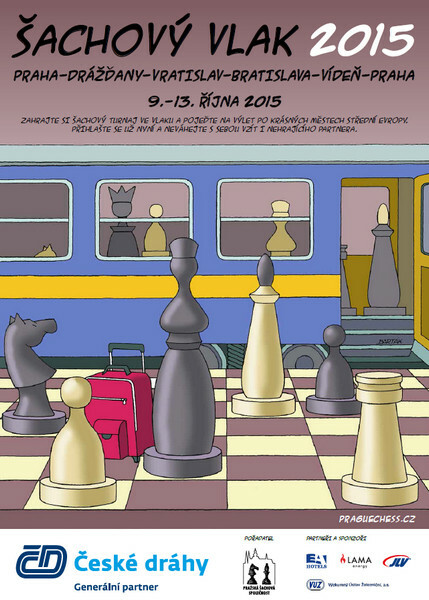 The 2015 train had 11 carriages, standard Czech Railways (České dráhy) cars decorated for the event and each named for a world champion chess player. 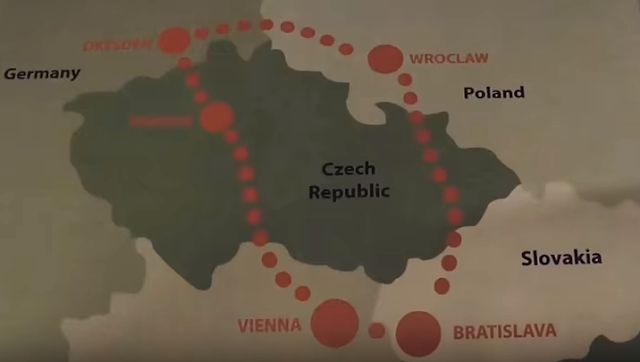 In 2015 the route was Prague - Dresden - Wroclaw - Bratislava - Vienna - Prague, over 4 days. 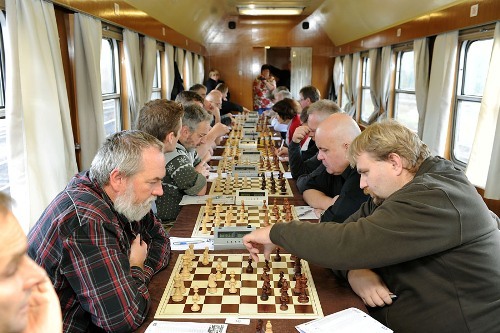 Four grand masters were competing as part of the 122 chess players on board. Any chess player could participate as long as they paid the registration fee (180 Euros). Participants described the venue as very interesting and entertaining, although it presented its own challenges. For example, the sun could shine on one player's face and distract him or her, or the movement of the train itself could be distracting. The winner of the individual tournament was Swedish grand master Lars Karlsson, who was also a pioneer of computer-based chess. EDIT: I was looking back through some of my European photos and I realized I had accidentally captured another chess train locomotive, 362 035-0 I believe.